Honda Motorcycle and Scooter India Pvt. Ltd. has rolled out the latest 360o campaign – ‘Effortless Style Gets Sportier’ for new CB Shine SP. Developed by Asatsu DK Fortune Communications (ADK-Fortune), the campaign is on air across all popular channels. From its debut in 2015, CB Shine SP is choice of youngsters seeking extra features and who aspire to be ‘special’. Honda’s urban commuter motorcycle CB Shine SP has gained several new value additions in 2018. The new tank shroud with speed lines enhances the style quotient adding an attitude of sportiness to overall appeal of the motorcycle. The 2018 CB Shine SP also gets new graphics, Digital-Analogue meter with Service Due Indicator and a low maintenance seal chain. The objective of campaign is to strengthen the style imagery of CB Shine SP and take it to the next level. It infuses an extra element of sportiness that comes from the refreshed new style of CB Shine SP. The campaign targets customers seeking for extra features in the segment and aspire to be ‘special’. The ‘Effortless Style Gets Sportier!’ campaign focusses on the evolution of the existing communication of the product- ‘Effortlessly Stylish’ and fortifies it along with the addition of a new flavor – ‘sportiness’ to it. The CB Shine SP makes the rider special and enables him to personify style naturally and effortlessly. The aspirational youngsters want to be stylish but do not want to be seen as trying too hard while being so. The new CB Shine SP with a host of attractive features and new refreshed styling is hard to resist and difficult to get un noticed on the roads. 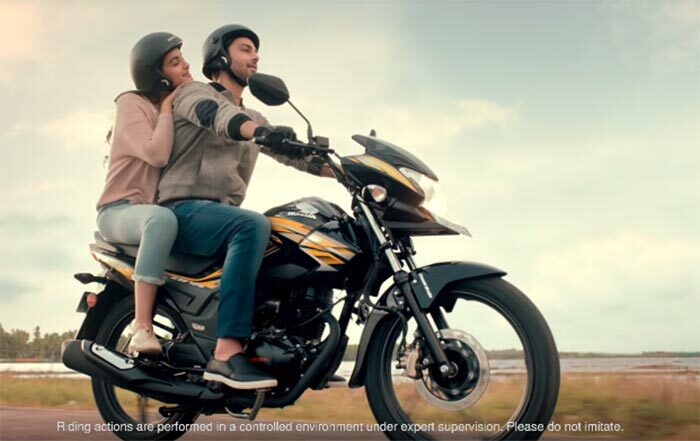 Honda’s ‘Effortless Style gets Sportier’ campaign is set in beautiful locations which gives a very fresh and focussed feeling to the film amplifying sportier than before image of CB Shine SP. The narrative reinforces how CB Shine SP is more than just a product but evokes a ‘special’ emotional connect. All this while rationally reinforcing that it is ahead of competition when it comes to product attributes. The story starts with a beautiful girl in her early 20’s, walking and exploring a street market. She stops at a magazine store and picks up a magazine. The cover page reads ‘Effortless Style’ with Bollywood actor- Himansh Kohli, featured on it. Attracted to his style, the girl sub-consciously starts dreaming. In her dream state, she imagines herself as a pillion with Himansh riding the stylish CB Shine SP on beautiful winding roads with green landscapes & tea gardens. As they continue to ride, the young female cuddles with the rider thoroughly enjoying the ride. While they glide ahead on smooth roads, camera focusses on special features of CB Shine SP – new sporty tank shroud, sporty graphics, digital analogue meter, Service Due Indicator & clock, low maintenance seal chain, 125cc HET engine, 5 speed transmission, Combi Brake System (CBS) with equalizer and low rolling resistance tyres. Completely engrossed in the company & the beautiful ride of CB Shine SP, she points out a spot during the ride and as they stop, she captures their moment of togetherness in a selfie. Her dream comes to an end as Himansh applies breaks on the motorcycle. She gets surprised to return back from her dream to the real world and realises the protagonist standing across the road leaning on the stylish sporty CB Shine SP. The sequence concludes with a voiceover- ‘You are special in every way’, highlighting how every CB Shine SP rider is special. The film ends with ‘Honda CB Shine SP. Effortless style gets sportier’. 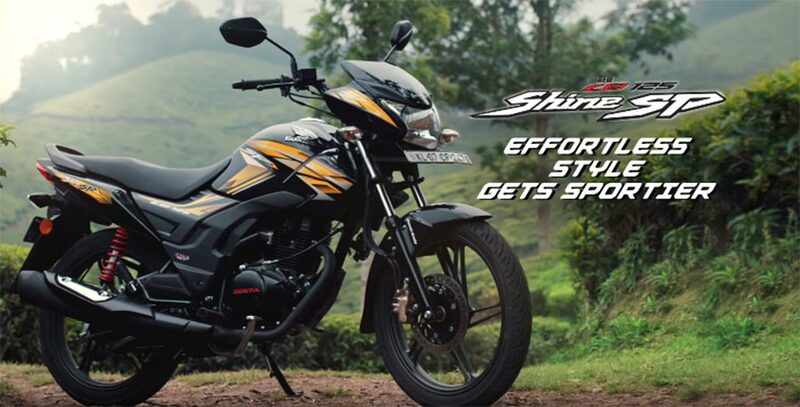 The new CB Shine SP ‘Effortless style gets Sportier’ campaign differentiates the CB Shine SP rider as someone who doesn’t have to try hard to look stylish, he is effortlessly stylish naturally. And now he gets an extra boost of sportiness which makes him a bonafide style icon. The new Honda CB Shine SP has gone up a notch above with its sportier looks and features. It truly mirrors the riders’ imagery whose effortless style exudes a certain charm. In a rather playful and sporty way. Honda CB Shine SP has a distinct imagery compared to Honda CB Shine. It is younger and cooler. And all its new features make it distinct. We have captured the essence of the brand in a simple story shot beautifully. We’re thrilled to help create the next chapter of the Honda CB Shine SP. A stylish bike that does everything effortlessly. And adding to this effortless image of the brand is its sporty features. We kept it simple. A storyline that is all about the bike and how it makes the life of its user effortless. Being a part of the CB Shine SP family it gives me great pleasure to star in this ad. The motorcycle’s style quotient attracts the youth and the new sporty looks is an added attention.